If you want to take all the stress, hassle and organising out of your holiday, our guided tours are a great option. On your guided tour you won't need to think about anything but skiing or snowboarding! You will have a guide/driver/host who picks you up in the morning, drives you and your group to the mountain and guides you seamlessly around the ski resort, all while avoiding the crowds on the slopes and at lunch. Once you have a good feel for the slopes, you can take off on your own for a while, or stick with the group and find the powder stashes with the guide. We group individuals, duos and small groups of friends together for a fantastic week on the snow. You literally get an instant group of like-minded ski or snowboard friends. Our guided tours are perfect for you. We also group families together to make our family guided tours an easy and affordable option for families. You will be grouped with another one or two families, and your guide/driver/host will prove invaluable. We know as a parent you are consistently managing the day, and as its your ski holiday we are going to take care of that day to day management for you! We will do the driving, make sure you and the kids are in the right place a the right time, organise ski school, look for that lost glove, and even make that dinner reservation for you. You can just clear the mind and enjoy the snow! These family tours are perfect for families. All our tours are based in one place, and the tour aspect comes from visiting multiple resorts in that area. Choose from two destinations, Queenstown or Wanaka. 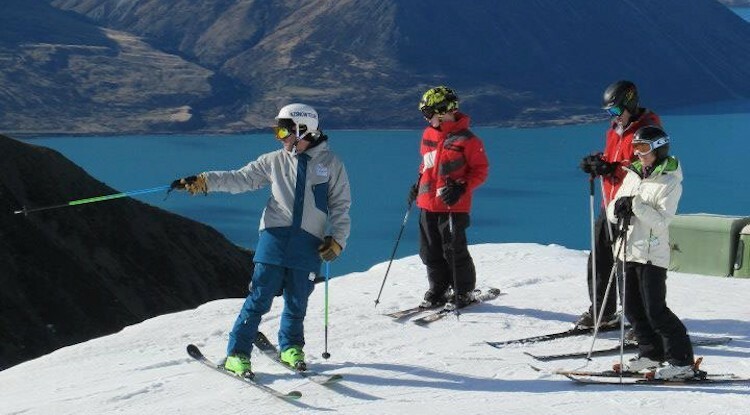 Queenstown, surrounded by craggy peaks and set on the shores of crystal clear Lake Wakatipu, is often the first place that people think about when planning a ski or snowboard holiday to New Zealand. Learn more about Queenstown by clicking here. As one of the smallest and most beautiful towns in scenic New Zealand, Wanaka is the perfect destination for your winter holiday. A 2013 winner of Trip Advisor's Traveler's Choice Award, Wanaka will leave you breathless and have you planning your next visit from the moment you arrive. Learn more about Wanaka by clicking here. If this sounds like you? Check out our four guided snow package options over on the grey tabs to your right if your on a desktop/laptop, or scroll below if you are using a mobile or tablet.